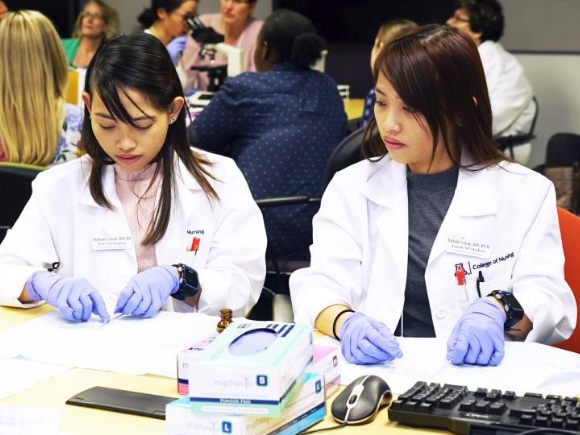 The number of advanced practice registered nurse students and graduates increased under the Centers for Medicare & Medicaid Services’ Graduate Nurse Education demonstration project, according to a new report to Congress by the Department of Health and Human Services. “The GNE demonstration had a positive impact on APRN growth, and helped transform clinical education within participating GNE schools of nursing,” the evaluation report concludes. The Affordable Care Act authorized the Medicare demonstration to test whether paying eligible hospitals to help offset the costs of clinical training for APRN students could help increase the nation’s primary care workforce. In 2012, CMS selected five hospitals affiliated with 19 university schools of nursing (including the University of Arizona College of Nursing) and hundreds of community clinical partners and collaborating health systems to participate in the program: Duke University Hospital in Durham, NC; Hospital of the University of Pennsylvania in Philadelphia; Memorial Hermann-Texas Medical Center in Houston; Rush University Medical Center in Chicago; and HonorHealth Scottsdale (AZ) Osborn Medical Center. The AHA’s American Organization of Nurse Executives subsidiary played a significant role in developing the original concept for the demonstration.